Hacktivists say they’ve identified the Ferguson, Missouri law enforcement officer responsible for the shooting death of Michael Brown, an unarmed teenager killed on Saturday following an alleged altercation with the police. A Twitter account associated with the hacktivist collective Anonymous said on Thursday that they've named the officer who killed Brown, 18, over the weekend, and have posted photographs purported to be of the man. Law enforcement has thus far been unwilling to publicize the name of the officer involved in the shooting death despite calls from the public and press alike. Hackers and activists affiliated with the internationally-dispersed Anonymous collective have vowed to disclose the cop’s identity if officials declined to do so on their own, however, and on Thursday said that Willman is the officer responsible. “St. Louis County PD claims Bryan Willman doesn't work for them or #Ferguson PD. We'll see about that,” TheAnonMessage Twitter account tweeted early Thursday. Moments later at 11:00 am CST, the same account posted screenshots alleged to have come from Willman’s personal Facebook account earlier this week, and outted him as the shooter. “Yep, nobody will find me with that name!” Scooby Willman wrote in a comment accompanying the picture. “But the job title says it all. Guessing everyone is forgetting about that,” responded a follower. “You have a good point. All changed! !” replied Willman. Earlier Thursday, the official Twitter account for the St. Louis County Police Department declined that Willman was an employee of either their office or the Ferguson PD. 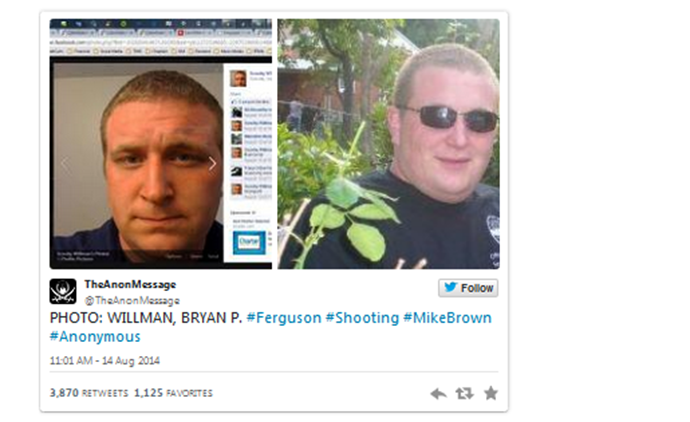 @TheAnonMessage Bryan Willman is not even an officer with Ferguson or St. Louis County PD. Do not release more info on this random citizen. Hacktivists involved in the Anonymous campaign known as #OpFerguson told RT’s Andrew Blake on Thursday that they would continue to steadily release information about the officer they believe to have killed Brown, and promised to post his address and other personal information later in the day if law enforcement failed to name the officer on their own. “The US government misfires and accidentally kills citizens all the time, especially overseas, and no one bats an eye. But if a wrong name is released because THEY refuse to release one? 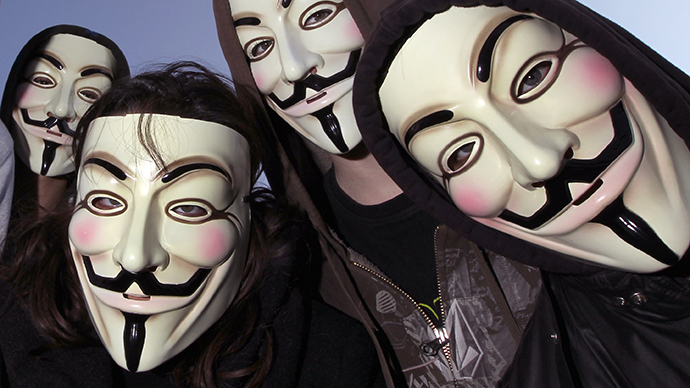 That's cool, because we don't have the data they do,” one Anon involved in #OpFerguson told Blake. Later that morning, Twitter suspended the TheAnonMessage account, just short of when its administrators planned on publishing further details about the alleged officer responsible. By that point, though, Anonymous had already released a fair share of details believed to be linked to Brown's death, including 911 dispatch audio spanning from when he was killed on Saturday until later in the day when police were dispatched in droves to the scene of the crime. Meanwhile, the American Civil Liberties Union filed a lawsuit on Wednesday requesting all public records related to the Ferguson shooting.